Volvo Trucks North America and parcel carrier FedEx Corp. demonstrated on June 27 a platooning system with three twin trucks on a stretch of Route 540 in North Carolina, one of 10 test sites for driverless cars designated in 2017 by the U.S. Department of Transportation. The trucks traveled for 18 miles, moving in and out of traffic as vehicles cut between the platoon and using ramps to enter and exit the highway. Professional truck drivers in Volvo VNL tractors were used in the demonstration, each pulling double 28-foot trailers. The tractors communicated using Cooperative Adaptive Cruise Control, a wireless vehicle-to-vehicle communication technology. 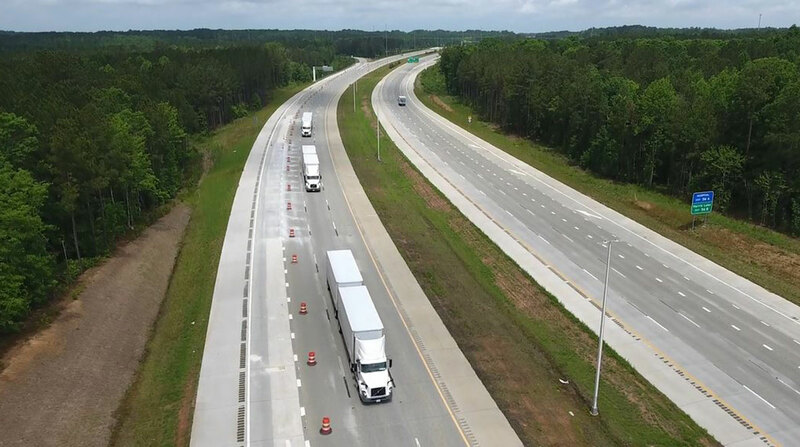 The two collaborators have been testing the platooning system that uses Volvo technology with the North Carolina Turnpike Authority since April. This marks the first public on-highway showcase of platooning technology between a major truck manufacturer and a transportation company in the United States, according to Volvo. Volvo engines and transmissions, along with Bendix brakes, were used in the project. The test didn’t involve Peloton Technology, a platooning developer that successfully tested its systems in Michigan and Florida in December. Volvo is an investor in Peloton. Dedicated short-range communication that allows for the V2V communications also was used in the North Carolina demonstration. A portion of the public bandwidth of radio waves has been reserved for DSRC use to promote highway safety. “Dedicated bandwidth within the 5.9 GHz spectrum is critical for the successful deployment of V2V applications, like truck platooning,” said Keith Brandis, VTNA vice president for product planning. In the demonstration, the driver in the lead vehicle controlled the brakes of the two following trucks. The drivers in the following trucks must keep their hands on the wheel and ensure their vehicle stays in its lane. Incoming CEO John Smith said FedEx Freight participated in the test because platooning can conserve fuel, improve the driver experience and make truck driving more efficient. The tractors and trailers traveled at speeds of up to 62 mph while keeping a time gap of 1.5 seconds. While some might consider that distance close, Volvo contends that the technology is safer than typical highway driving. The V2V system allows for the lead truck to hit its brakes and simultaneously transmit a command to the following trucks to brake. Their braking response is nearly instantaneous and much faster than human driver reaction time to a sudden braking event, according to Volvo. Platooning also has proved to reduce fuel use because it reduces drag between the trucks. The North American Council for Freight Efficiency and the National Renewable Energy Laboratory found in separate tests a combined fuel savings of 6% to 7% for a two-truck platoon. Volvo was involved in a recent test in Canada, where tightly spaced three-truck platoons proved to be more fuel-efficient than two-truck operations. The test included NREL, Volvo and the University of California-Berkeley. The test at a Transport Canada center in Quebec was done with three tractor trailers outfitted with side skirts and boat tails, weighted to about 65,000 pounds and using CACC systems. The lead truck saw fuel savings of 10%, the middle truck of as much as 17% and the trailing vehicle of 11% when the trucks were 4 meters apart. That translates to a time gap of 0.14 seconds compared with the 1.5-second gap used in North Carolina. “The trend is that the closer together, the average savings across all three trucks goes up,” said Steven Shladover, a UC-Berkeley research engineer who worked on the project. Several firms are moving aggressively on platooning. An executive with Mountain View, Calif.-based Peloton told Transport Topics that it expects its technology to be operating commercially by the end of this year. Daimler Trucks in June opened an automated truck research and development center at its North American headquarters in Portland, Ore., and demonstrated its prototype two-truck platooning system with automated steering capabilities at the Portland International Raceway. Like Volvo, the Daimler system uses V2V communications to coordinate braking activity between the trucks, enabling the second truck to travel at a closer-than-usual distance that reduces aerodynamic drag and boosts fuel economy. The following distance was 15 meters in a demonstration at the raceway.